The Mudra wrap seems to be a thinner knit then the other wraps that have been out recently judging by the sheerness of the top picture. Also, I”m really liking the back pleat and hem design much better. Picture on the right shows the wrap shortened using the buttons. Would be nice to see that from the front as well. Love the Mudra – I think it would be perfect for spring or cool summer evenings. 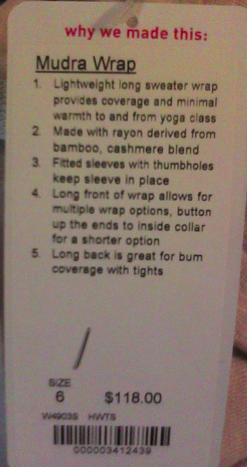 I wonder how durable it is because I tend to be rough on my clothes…. Ok Ive decided I NEED this!!! Where has it been spotted? Yay!